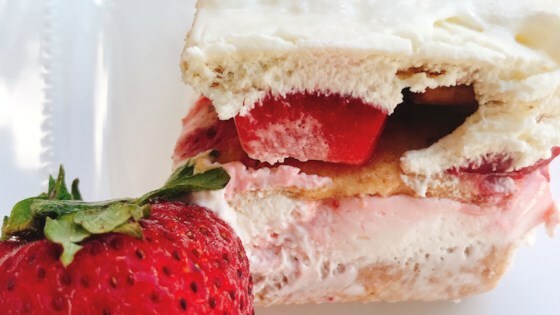 "A whipped cream cheese and strawberry filling makes for a decadent no-bake dessert." Beat cream cheese, confectioners' sugar, and vanilla extract with an electric mixer until smooth. Add heavy cream and beat on high speed until soft peaks form. Arrange a single layer of graham crackers in a 9x13-inch pan, covering the bottom as much as possible. Spread 1/4 of the whipped cream mixture evenly over the crackers. Top with sliced strawberries. Place another layer of graham crackers on top, followed by another 1/4 of the cream and strawberries. Repeat with 2 more layers of cookies, cream, and strawberries, ending with a layer of cream. Smooth the top, cover with plastic wrap, and refrigerate until flavors combine, 4 hours to overnight.